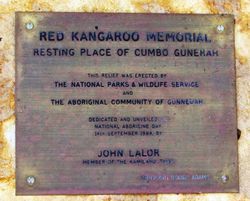 A monument commemorates Aboriginal warrior, Cumbo Gunnerah who was buried adjacent this spot. In the 1960s, the Gunnedah Historical Society erected a sign to mark the burial site of "The Red Chief". This sign still stands on the footpath near the corner of Abbott and Little Conadilly Streets. In 1984, a sculpture, designed by Dennis Adams in consultation with local Aborigines and the NSW National Parks & Wildlife Service was erected to mark the burial site. It was opened on National Aborigines' Day, 14 September, and officially dedicated by one of the oldest members of the local Aboriginal community, John Lalor. Buried probably in late 1700`s. Cumbo Gunnerah was the legendary warrior and wise leader of the Gunn-e-darr people of the Kamilaroi tribe. He was buried, it is thought, in the late 1700’s in a manner befitting an Aboriginal man of great importance, that is in a sitting position, backed by a tree carved with totemic designs in his honour. The stories of his unsurpassed bravery, achievements and adventures were handed down from generation to generation and his burial place was treated with great respect. Some two centuries later, European settlers dug up the remains of Cumbo Gunnerah and sent them, along with a slab of what was locally known as “The Blackfellow’s Tree”, to the Australian Museum in Sydney. RESTING PLACE OF CUMBO GUNERAH. The Aboriginal Community Of Gunnedah. Ngihrngu mari ngihrma gayir Gaweh CANUHR. Ngihrma binal wuraya, wahrunggul yiliyan ginyi.